The ICR (Institute for Creation Research) recently spent eight years on a project known as RATE (Radioisotopes and the Age of The Earth). The RATE team claims the results have yielded convincing and irrefutable scientific evidence of a young earth. John Baumgardner, a geophysicist with expertise in tectonic modeling, presents experimental data claiming to show that all biological material contains intrinsic radiocarbon, no matter how old that material may be thought to be.2,3 He makes additional claims that even non-biological carbonaceous material contains intrinsic radiocarbon. He suggests that this radiocarbon is residual from the material’s creation. If true, his claims would have far-reaching implications for the ages of these materials. I think this one is up your alley; if not, I’ll try sending it to John Baumgardner. I was working on a ppt presentation and including a slide about C-14 in diamonds. I try to be very careful to use only the best evidenced, most reliable arguments. I was checking something out on the internet and came across a critique of RATE by a (professedly evangelical) Old Earther named Kirk Bertsche. His critique was written in 2008. Taylor and Southon have also measured unprocessed diamond, finding a similar range of 0.005 to 0.03 pMC without background subtraction. They interpret this result as their instrument background, primarily due to ion source memory. Their ion source current varied, unintentionally, over about a factor of two, perhaps due to crystal face orientation or to conductivity differences between samples. 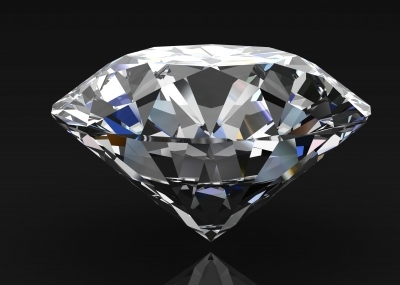 “The oldest 14C age equivalents were measured on natural diamonds which exhibited the highest current yields”. This important observation provides evidence about the source of the radiocarbon. What’s the answer to this? How robust are our measurements of C-14 in diamonds? Our case obviously doesn’t stand or fall on this one, and I want to be sure to use only the best arguments. In his 2008 critique Bertsche references the Taylor and Southon 2007 paper describing their application of accelerator mass spectrometry (AMS) to natural diamonds. Bertsche calls attention to the authors’ statement, “The oldest 14C age equivalents were measured on natural diamonds which exhibited the highest current yields.” He claims that this means that the measured C-14 cannot be intrinsic to the diamonds themselves. What Bertsche fails to mention is that the correlation of low 14C level with high ion current was restricted to only a subset of the authors’ data. Such a correlation did not exist across all the samples the authors tested and reported. That pattern occurred only among the eight diamonds listed in part B of Table 2. Five of these diamonds were mounted with silver powder beneath them in the 1.6 mm holes drilled in the aluminum cathode sample holder, while the other three did not have the silver powder. The purpose of the silver powder was to enhance the thermal conductivity between the diamond and the aluminum sample holder. This difference in mounting procedure resulted in the surprising and unexplained increase in ion current and decrease in the number of 14C atoms detected as shown in part B of Table 2 for the samples without the silver powder. How do the authors interpret this pattern? They state, “Previous tests showed that 14C count rates from silver powder cathodes were comparable with those from diamonds. Because of this and because the silver packing was largely shielded from the cesium beam by the diamonds themselves, the excess 14C was therefore probably due to differences between diamonds or run-to-run changes in the spectrometer, not from carbon in the silver powder.” Note that the authors emphatically do not attribute the higher 14C counts, as Bertsche claims, to ion source memory contamination. One good reason for the authors’ caution was the absence of this trend of higher 14C count with lower ion current in the measurements reported in part A of Table 2. Part A results are from a single diamond that was split into six individual pieces. Results for these six samples show little variation in 14C levels despite moderately large differences in ion current. For example, samples 12674 and 12675 yielded the same 14C value of 0.015 pMC, despite the fact that sample 12675 displayed a 50% higher beam current compared with sample 12674. The correlation Bertsche is relying upon for his interpretation is altogether missing for the six samples listed in part A of Table 2. The simplest explanation for the trend in the eight samples in part B is that it is associated the presence or absence of the silver powder. Precisely how the silver powder might be producing the observed trend is not clear. Indeed, the authors acknowledge their inability to provide a confident explanation. Regardless of the actual cause, the glaring fact remains that Taylor and Southon detected levels of C-14 in the diamonds they analyzed that were all well above the intrinsic sensitivity of their AMS hardware. The overall conclusion is that the C-14 levels in natural diamond reported by Taylor and Southon are consistently far above the levels one would expect if these diamonds were truly more than a few hundred thousand years old. Despite the conflict it raises for Bertsche’s worldview, the Taylor and Southon paper tangibly strengthens the case that AMS instrument background can be eliminated, to a high degree of certainty, as a viable explanation for the substantial 14C levels measured so routinely in carbon-bearing samples from deep within the geological record.